An Israeli helicopter launched missiles at a Hamas command center in the southern Gaza Strip, killing at least four people, after Hamas fired rocket barrages into Israel. Hamas gunmen fatally shot six bodyguards from the rival Fatah movement and mistakenly ambushed a jeep carrying their own fighters, killing five. The streets of central Gaza City echoed with the rattle of gunfire, and were empty except for gunmen in black ski masks. Terrified residents huddled in dark homes after electricity to some downtown neighborhoods was cut off by a downed power line. The violence threatened to bring down the Palestinians' fragile, two-month-old Hamas-Fatah unity government and brought the Palestinians dangerously close to all-out civil war. "What is happening in Gaza, endangers not only the unity government, but the Palestinian social fabric, the Palestinian cause and the Palestinian strategy as a whole," said Palestinian negotiator Saeb Erekat. Despite Israel's vow to stay out of the fray, its missile strike added another layer of complexity to Gaza's mayhem, and raised the specter of a large-scale Israeli invasion. At mid-day Wednesday, policemen from the Fatah-allied Preventive Security organization arrested five Hamas men and were driving them through Gaza City when the vehicle was ambushed by Hamas fighters, Preventive Security officials told The Associated Press. Five of the Hamas men were killed, along with two Fatah men, they said. Hamas radio reported that a Hamas man was killed in another clash, and a nurse traveling in an ambulance was shot in the head after being caught in the crossfire, hospital officials said. Her family said she was brain dead and being kept alive by a respirator. On Wednesday afternoon, a group of about 200 Palestinians marched through central Gaza City, waving Palestinian flags and demanding an end to the fighting. Dozens of masked gunmen used the cover of the demonstration to improve their positions on the street, and then opened fire on the demonstrators, wounding eight people. The rest ran away, leaving the streets to the armed men. In Gaza City, Hamas gunmen set fire to an 11-story apartment building housing Fatah lawmaker Nema Sheik Ali, the wife of the head of Preventive Security. Witnesses said the gunmen broke into her 5th floor apartment and beat up her and two of her children before torching the building. The militants prevented people from evacuating the building as women and children screamed, pleading to be let out. In four days of fighting, 41 people have been killed in the infighting, and dozens more have been injured. The majority of the fatalities have been from Fatah. Fighting raged close to Palestinian President Mahmoud Abbas's heavily guarded compound Wednesday morning, which was also targeted by Hamas mortar fire overnight, and the bodies of two Fatah gunmen could be seen sprawled on the street nearby. Abbas, a moderate from Fatah, was not present. Early Wednesday, Hamas gunmen fired mortars and pipe bombs at the home of Fatah security chief Rashid Abu Shbak, before storming inside and killing six bodyguards, Palestinians security and medical officials said. Abu Shbak and his family were not home at the time of the attack. Abdel Hakim Awad, a Fatah spokesman, angrily accused Hamas' leadership of the attack, charging that the Islamist group "wanted to turn Gaza into a new Somalia or Darfur." Hamas officials said the organization's men launched eight rockets at Israel on Wednesday, following a barrage of around 20 rockets a day earlier. That salvo at the Israeli town of Sderot, just outside Gaza, wounded five Israelis, one seriously a woman whose house took a direct hit, said police spokesman Micky Rosenfeld. There were no casualties Wednesday morning, but school was canceled in Sderot and residents huddled in bomb shelters. Hamas said its rockets were retaliation for Israeli violence, but more likely it was an attempt to draw Israel into the fighting as a way of uniting the Palestinians against a common foe. Wednesday's violence in Gaza followed a stunning Hamas attack the previous day on a group of Fatah-affiliated policemen at the coastal strip's only cargo crossing, a strategic installation where U.S. experts have been involved in planning security. In that attack, Hamas gunmen surrounded a Fatah police jeep and riddled its passengers with bullets at close range, killing eight. Israeli Defense Minister Amir Peretz summoned army commanders for late-night consultations to consider Israel's next move. Israeli security officials said there would be no large-scale military response to the rocket fire so as not to play into Hamas's hands. 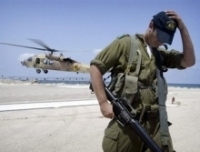 "Israel is not going to be dragged into the Gaza Strip the way that Hamas wants. We will choose the time, the place to respond and we will protect our citizens," said Israeli government spokeswoman Miri Eisin. On Wednesday, an Israeli aircraft fired missiles at a Hamas's military headquarters in the southern Gaza town of Rafah, Palestinian officials and the army said. Palestinian medical officials said four Hamas gunmen were killed and 30 others wounded. In a rare display of unity, Hamas and Fatah men worked together to evacuate the casualties. Israel was briefly drawn into the internal Palestinian violence Tuesday during the border crossing attack, when Israeli troops shot and killed a Fatah man who approached the border fence during the Hamas attack. On Hamas' radio frequency, the organization's fighters could be heard referring to their Fatah rivals as "American mercenaries," a reference to the Western support enjoyed by Fatah. Gaza's turmoil further weakened hopes for a resumption of Israeli-Palestinian peace talks, despite a new push by the Arab world to bring the sides to the table. The offer proposes Arab recognition of Israel in exchange for an Israeli withdrawal from all lands it occupied in the 1967 Mideast War. Negotiations, however, are inconceivable if the Palestinians descend into civil war. Still, Israeli Prime Minister Ehud Olmert and King Abdullah ll of Jordan met Tuesday at the king's seaside palace in Aqaba in the highest-level attempt yet to push forward the Arab initiative. This week's fighting was the worst since Hamas and Fatah agreed in February to share power. At the core of the fighting is the unresolved power struggle between Hamas, which won parliament elections last year, and Abbas' Fatah, which dominated Palestinian politics for four decades. After a year in power and squeezed by an international aid boycott, Hamas realized it could not govern alone and brought Fatah into the government. But the two sides never worked out all their differences, particularly over who would control the Palestinian security forces. Abbas spoke by phone Wednesday morning with Hamas leader Khaled Mashaal, who resides in Damascus, and the two agreed to work to end the violence. Their conversation had no discernible effect on the fighting.